If you want to watch sunrise from the national park at the top of Mount Haleakala, the volcano that makes up around 75 percent of the island of Maui, you have to make a reservation. Being at 10,023 feet, the summit provides a spectacular—and very popular, ticket-controlled—view. Just about a mile down the road from the visitors’ center sits “Science City,” where civilian and military telescopes curl around the road, their domes bubbling up toward the sky. Like the park’s visitors, they’re looking out beyond Earth’s atmosphere—toward the Sun, satellites, asteroids, or distant galaxies. And one of them, called the Panoramic Survey Telescope and Rapid Response System, or Pan-STARRS, just released the biggest digital astro-dataset ever, amounting to 1.6 petabytes, the equivalent of around 500,000 HD movies. From its start in 2010, Pan-STARRS has been watching the 75 percent of the sky it can see from its perch and recording cosmic states and changes on its 1.4-billion-pixel camera. It even discovered the strange ‘Oumuamua, the interstellar object that a Harvard astronomer has suggested could be an alien spaceship. An artist’s rendering of the first recorded visitor to the solar system, ‘Oumuamua. Big surveys like this one, which watch swaths of sky agnostically rather than homing in on specific stuff, represent a big chunk of modern astronomy. They are an efficient, pseudo-egalitarian way to collect data, uncover the unexpected, and allow for discovery long after the lens cap closes. With better computing power, astronomers can see the universe not just as it was and is but also as it’s changing, by comparing, say, how a given part of the sky looks on Tuesday to how it looks on Wednesday. Pan-STARRS’s latest data dump, in particular, gives everyone access to the in-process cosmos, opening up the “time domain” to all earthlings with a good internet connection. Today, that idea has morphed into Pan-STARRS, a many-pixeled instrument attached to a 1.8-meter telescope (big optical telescopes may measure around 10 meters). It takes multiple images of each part of the sky to show how it’s changing. Over the course of four years, Pan-STARRS imaged the heavens above 12 times, using five different filters. These pictures may show supernovae flaring up and dimming back down, active galaxies whose centers glare as their black holes digest material, and strange bursts from cataclysmic events. “When you visit the same piece of sky again and again, you can recognize, ‘Oh, this galaxy has a new star in it that was not there when we were there a year or three months ago,” says Rick White, an astronomer at the Space Telescope Science Institute, which hosts Pan-STARRS’s archive. In this way, Pan-STARRS is a forerunner of the massive Large Synoptic Survey Telescope, or LSST, which will snap 800 panoramic images every evening, with a 3.2-billion-pixel camera, capturing the whole sky twice a week. That latter part is not just interesting to scientists, but to the military too. “It’s considered a defense function to find asteroids that might cause us to go extinct,” says White. That’s (at least part of) why the Air Force, which also operates a satellite-tracking system on Haleakala, pushed $60 million into Pan-STARRS’s development. NASA, the state of Hawaii, a consortium of scientists, and some private donations ponied up the rest. Also, the Air Force redacted parts of the sky. It used software called “Magic” to detect streaks of light that might be satellites (including the US government’s own). Magic masked those streaks, essentially placing a dead-pixel black bar across that section of sky, to “to prevent the determination of any orbital element of the artificial satellite before the images left the [Institute for Astronomy] servers,” according to a recent paper by the Pan-STARRS group. In December 2011, the Air Force “dropped the requirement,” says the article. The magic was gone, and the scientists reprocessed the original raw data, removing the black boxes. The first tranche of data, from the world’s most substantial digital sky survey, came in December 2016. It was full of stars, galaxies, space rocks, and strangeness. The telescope and its associated scientists have already found an eponymous comet, crafted a 3D model of the Milky Way’s dust, unearthed way-old active galaxies, and spotted everyone’s favorite probably-not-an-alien-spaceship, ’Oumuamua. The real deal, though, entered the world late last month, when astronomers publicly released and put online all the individual snapshots, including auto-generated catalogs of some 800 million objects. With that dataset, astronomers and regular people everywhere (once they’ve read a fair number of help-me files) can check out a patch of sky and see how it evolved as time marched on. The curious can do more of the “time domain” science Pan-STARRS was made for: catching explosions, watching rocks, and squinting at unexplained bursts. Pan-STARRS might never have gotten its observations online if NASA hadn’t seen its own future in the observatory’s massive data pileup. That 1.6-petabyte archive is now housed at the Space Telescope Science Institute, in Maryland, in a repository called the Mikulski Archive for Space Telescopes. The Institute is also the home of bytes from Hubble, Kepler, GALEX, and 15 other missions, mostly belonging to NASA. “At the beginning they didn’t have any commitment to release the data publicly,” says White. “It’s such a large quantity they didn’t think they could manage to do it.” The Institute, though, welcomed this outsider data in part so it could learn how to deal with such huge quantities. “The Sloan Digital Sky Survey set the standard for these huge survey projects,” says White. Sloan, which started operations in 2000, is on its fourth iteration, collecting light with telescopes at Apache Point Observatory in New Mexico and Las Campanas Observatory in Northern Chile. From the early universe to the modern state of the Milky Way’s union, Sloan data has painted a full-on portrait of the universe that, like those creepy Renaissance portraits, will stick around for years to come. Over in a different part of New Mexico, on the high Plains of San Agustin, radio astronomers recently set the Very Large Array’s sights on a new survey. Having started in 2017, the Very Large Array Sky Survey is still at the beginning of its seven years of operation. 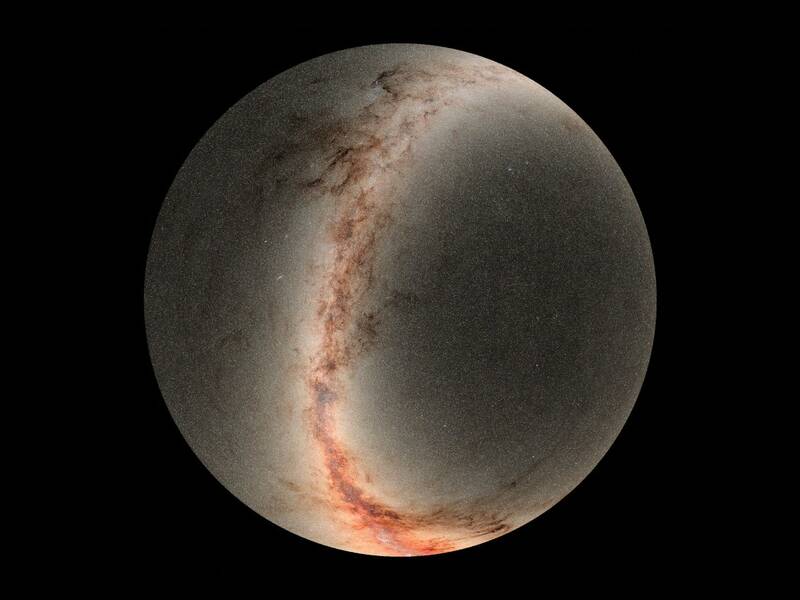 But astronomers don’t have to wait for it to finish its observations, as happened with the first Pan-STARRS survey. “Within several days of the data coming off the telescope, the images are available to everybody,” says Brian Kent, who, since 2012, has worked on the software that processes the data. Which is no small task: For every four hours of skywatching, the telescope spits out 300 gigabytes, which the software then has to make useful and usable. “You have to put the collective smarts of the astronomers into the software,” he says. Kent is excited about the same kinds of time-domain discoveries as White is: about seeing the universe at work rather than as a set of static images. Including the chronological dimension is hot in astronomy right now, from these surveys to future instruments like the LSST and the massive Square Kilometre Array, a radio telescope that will spread across two continents. Now, as of late January, anyone can access all of those observations, containing phenomena astronomers don’t yet know about and that—hey, who knows—you could beat them to discovering. Over in a different part of New Mexico, on the high Plains of San Agustin, radio astronomers recently set the Very Large Array’s sights on a new survey. Having started in 2017, the Very Large Array Sky Survey is still at the beginning of its seven years of operation. But astronomers don’t have to wait for it to finish its observations, as happened with the first Pan-STARRS survey. “Within several days of the data coming off the telescope, the images are available to everybody,” says Brian Kent, who, since 2012, has worked on the software that processes the data. Which is no small task: For every four hours of skywatching, the telescope spits out 300 gigabytes, which the software then has to make useful and usable. “You have to put the collective smarts of the astronomers into the software,” he says.